One doesn't need to look at box scores of the past games to figure out whether Josh Shipp is in a shooting slump. Just look at his body language on the court. The swagger Shipp normally carries onto the floor is missing. Against Oregon, Shipp attempted just a single three-point shot, and even then, one could see the slight hesitation before he cocked to let the ball go. Anyone watching the shot's trajectory knew the ball was going wayward, but the problem for Josh Shipp is that he knew the shot was going to miss before he even took it. Confidence is everything in shooting, especially if you're a rhythm shooter like Shipp. In his last six games, Shipp is 0 for 20 from beyond the arc. Before his recent shooting woes, he was making almost 40% of his three-point shot attempts. Moreover, Shipp's 154 three-point attempts are almost three times more than the next Bruin. But before UCLA fans start to, yeah I'll say it, jump Shipp, they have to realize this team will not go very far in the NCAA tournament without him. UCLA Coach Ben Howland obviously knows this better than anyone else, and is allowing Shipp to work through his recent shooting woes. Despite struggling with his shot, Shipp played 35 minutes against the Ducks on Saturday. Howland realizes, come tourney time, the play gets rougher inside and the paint gets smaller. The Bruins are a talented bunch. Freshman Kevin Love is a beast inside and tough to stop, Russell Westbrook has NBA-crazy athleticism to get to the basket, and Darren Collison is the quickest in the land, but without Shipp's outside shooting, the Bruins are vulnerable to teams packing it inside on them. The good news about Shipp's shooting slump is that it is old news too. It has happened before, a matter of fact it did just last season. Shipp went through a similar slump last season, going 2 of 17 over a seven game span, but he regrouped and found his shot at the end of the season and tournament time. As a result, Shipp was a major factor in UCLA's Final Four run last season. No doubt Shipp is mired in a horrific shooting slump, but the only way he'll break out of it is by shooting himself out of it. He needs to regain his swagger. With four regular season games remaining, there is still time. Agreed. We need Shipp to go far this year. As an outside threat but also we need him to drive and dish and more slashing. The thing I used to love about Shipp was that he used to have a nose for the ball. Errant shots used to be easy lay ins for him. He used to slash and drive to the basket for easy assists or shots for himself within 10 ft of the basket. Now he just sets up camp outside of the 3 line and becomes predictable. Yes he needs to shoot more 3's to give us a legit outside presence but we also need him to be the Josh of old and make plays happen around the rim. We definitely need Shipp to play big time for us. With him hitting from outside, it opens it up for Kevin and Luc. Glad to see him doing other things to help the team while hes slumping. I thought Shipp did a pretty good job on Malik yesterday too defensively. ASK: You are exactly right. When we first fell in love with Shipp, he wasn't even much of a scorer. I thought he was an exceptional offensive rebounder and really had a nose for the ball. I also remember Shipp being super-nervous in his first couple of games. He should just relax, focus on playing great defense and doing whatever it takes to help his team win. He is not the focus that Afflalo was last year. We don't need his 3-point shooting; we need him to be the complete player that he is. Josh: stop thinking so much and just play your heart out. You don't want to be the Alex Rodriguez of college basketball. Shipp just has to stop thinking/hesitating before taking a shot. He knows he can make shots and I am sure he proves it during practice. Whatever is going on with him, he just has to wipe his mind clean and just shoot! BRR is there any news on Roll...some outside game would be a big help at this point. Roll is done for the year folks. Even if he returns (which I seriously doubt), his play would definelty not be game ready, let alone, tourney ready. Let him sit, rest, and recover. We will need him next year as a vetern player since Mata-R. will graduate, likely that Love, Collison, and Westbrook will all declare, possible that Luc will too depending on how he does in the Big Dance, and Aboya graduating early (he could leave). In short, basically UCLA will have a completely different look next year with sick talent, but VERY young. Roll's experience will be key! Coach Howland has stated that Michael Roll will likely apply for a medical redshirt this season. With only two weeks left in the regular season, it would be extremely difficult to work himself back into physical condition and flow on the floor at this point. If he was to come back at any time over the next few weeks - and there is no sign he could, he'd probably only be able to contribute spot minutes, and that would be a waste of his eligibility. 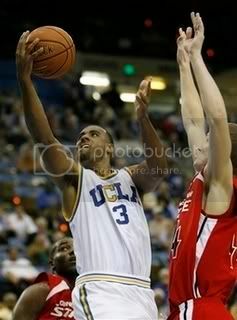 But agreed, the Bruins could certainly use another experienced backcourt player/perimeter shooter in the tournament. I believe the bottom line is if Shipp doesn't step up and contribute at least 10 to 12 points a game, we will not go too far in the tournament. That puts too much pressure on our other scorers, Love, Collison, & Westbrook. Actually when any one of those four has a subpar scoring game, we really struggle to break away from our opponents! Good luck Josh in overcoming this slump! We all know you CAN shoot!